SYDNEY — NanoRacks announced Oct. 3 that it had raised an undisclosed amount to support development of a commercial airlock module for the International Space Station. Nanoracks gave a presentation about their airlock at the ISS R&D Conference 2017. After reading plans of Bartolomeo platform allowing larger external payloads if they could fit through the Bishop A/L, I've been trying to find info on how such payloads would be transferred. How does the hand-off work? I thought Bishop was depressurized and unberthed as a unit and held by the SSRMS. 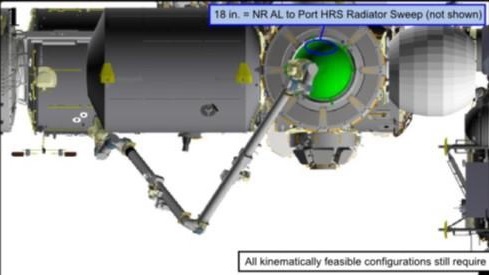 So, I get how they are deploying the "haybale" deployers (NRSS or Lightband) but how do they move external payloads out with the arm already engaged in holding the airlock? Node 3 Port has clearance issues with the rotating Port TRRJ, hence robotics access may be an issue. In the presentation you linked in this comment there was a slide that listed the clearance with the A/L installed on Node 3 Port to the Port HRS as 18 inches. Linking a screencap. Virtually all new systems suffer schedule slip. Schedule and cost estimates assume that nothing will go wrong. Since something always goes wrong then either double or triple the estimate to get how much you are going to pay and when to expect to get the item. In point of fact, almost all major projects have "slip time" built into them. This is time pre-dedicated to handle the unanticipated problems that will crop up as a program processes. AFAIK, very few (if any) major development programs have ever come in on time and on budget without slip times having been built in. All that it means is that the program proposers had a better-than-average feel for the kinds of issues they might encounter, and how much slip time to build into their development schedule to account for them. Thales Alenia Space will be added to the industrial team. They will build and test the pressure shell. Since Bishop A/L has a few grapple fixtures on its exterior would be handed off to eitherJEM RMS or MBS POA and the object extracted via Dextre. The Deployers I believe would be attached to Bishop via a common FRAM interface. The NanoRacks Space Station Airlock Module “Bishop” met another major milestone with completion of the Critical Design Review (CDR) on March 20 and 21, 2018 in Houston, Texas. This milestone begins the transition from the engineering design phase to the fabrication phase. Detailed design drawings such as those for the critical pressure shell will be signed and released to NanoRacks fabrication partner, Thales Alenia Space, in order for them to continue their fabrication efforts. Given the trend in scheduling of distant CRS missions, likely to end up in 2020. Also, in perusing NanoRack's airlock webpage, I came across a new version of their airlock presentation. Compared to the 2017 version, they added some nice new slides in the beginning giving company information/highlights as well as mentioning their intentions to move into building commercial stations in the future. Besides that and an update to their schedule most of the changes are minor/cosmetic. I'm attaching both the new presentation in pdf form and a screencap of the updated schedule (which, based on the press release posted above, is now looking like it is a month behind). One thing I've always been unclear about is their monetization mechanism/model. I can understand charging "rent" for external payloads that are attached to the airlock. But how exactly do they get paid for operating the airlock directly? Does NASA pay them per operation? or do small sat or micro/cube sat companies pay to go through the gate? Or is NASA essentially paying a flat contract for supplied services up to X number of openings per year? Has anyone seen or heard anything directly addressing this? Uses equalaterial trunnion pins like the IDA's. Not sure if it will be secured in the trunk the same way. We have a #BishopAirlock update! Working very closely with @NASA and @BoeingSpace, #BishopAirlock is targeting launch to @Space_Station on @SpaceX CRS-21 next year! Manufacturing is near completion, and seal leak checks are complete at the @Thales_Alenia_S facility in Italy.